You don’t have to be a wine snob to understand that wine tastes better when it’s at least reasonably close to its right temperature. The question is how to keep an eye on that, when the wine is typically trying to warm up to room temperature which could easily be TOO warm for the wine. 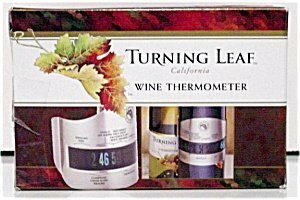 With a collar device like this Turning Leaf Wine Thermometer Bottle Collar, the answer is easy. You just slip the collar onto the bottle and let it sit there. It will continuously show you the wine’s current temperature just like a fish tank thermometer does. Glance over and see if it’s sliding out of the range, at which point you can grab an ice bucket. This isn’t the height of medical accuracy here. You’ve got a fish tank style thermometer stuck onto a metal collar which then grabs loosely onto the bottle. Now the collar has to cool down to bottle temperature to get the reading to show up. It takes a little while. Still, it’s much better than making random guesses. Also, the collar has printed on it the various wine temperature ranges, so you can just glance to see it’s in the right spot for a Chardonnay or not. It makes things much easier. Downside? It’s sort of big and clunky to carry in a purse when you go out. I prefer the pocket-sized IR thermometers for those situations. But for at home? Easy enough to toss this on a bottle and always know what’s going on.